After lunch in the Al Hamra oasis, we make a brief stop to see the abandoned Persian village of Ghul before climbing 2,000 metres up into the mountains. Our destination is Jebel Shams (Mountain of the Sun), Oman’s highest mountain at 3,028 metres (just over 10,000 feet). 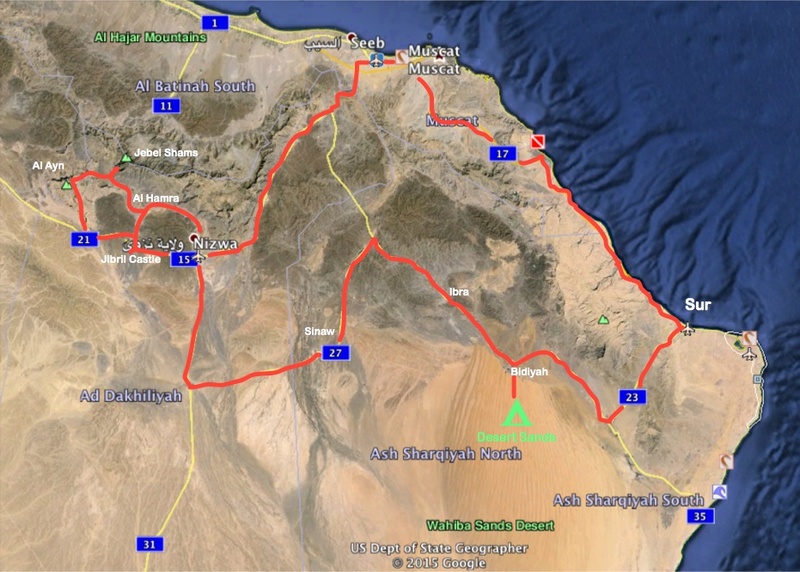 We stay at the Jebel Shams Resort, which is at the end of a long, winding and steep road. The resort is situated a few hundred metres from Wadi Ghul, the Grand Canyon of Arabia. I walk over from the resort to the rim of the canyon before dinner, and find a spectacular sight that is much deeper than the Grand Canyon in Arizona. I peer over the edge of Wadi Ghul to a small abandoned village barely visible almost 1,000 metres below! The wind is terribly strong, but at least it is blowing up the canyon and over the rim, so it isn’t a safety hazard. I find taking photos of the canyon in the late afternoon very challenging, and resort to bracketed photos and HDR settings. Jebel Shams Resort has pretty basic accommodation compared to the luxury we have had so far on the tour. I keep the electric heater going in my room, since at this elevation, it gets very cold at night. The Internet connection is down, so I use my time this evening to catch up on my journal and tag my photos with locations and titles. I get up before dawn this morning and take some photos of the mountains bathed in the pre-dawn light. The pre-dawn view of the mountains, the Earth’s shadow and the Belt of Venus is spectacular! After an early breakfast, we drive (as a group) the short distance from the resort to see and photograph Wadi Ghul after sunrise, and then drive down the mountain and onto the wadi and other sights before returning to Muscat and civilization. This entry was posted in Oman and tagged canyon, hotel, map, mountains, oasis, sunrise, valley, wadi. Bookmark the permalink.